Do you really need to do a survey for loft boarding? It is surprising how many people will ask, "Do you have to come out to do a quote? I just want a rough price"
Well, contrary to popular belief that most people still think loft boarding is a simple easy job and requires no thinking out, I'm afraid this is wrong. Long gone are the days of DIY Dan, we now have an industry of professional loft storage companies who are doing things properly. Like any building work, it requires planning and lots of thought. Do you think your loft is the same as your neighbours house, even if the houses are identical from the outside? No, there are always some slight differences that really matter. For instance, when the house was built where did the electrician run all his cables? Where did the plumber put all his pipes and boiler etc? Where did they put the TV aerial, ventilation system, extractor pipes and now solar PV equipment, etc? Bearing all this in mind when older houses were built, variations of these houses were pretty huge. So supporting walls, purlins, pipes and cable runs and loft access could all be different. This is why at Loft Boarding NW, we always do a FREE survey and written fixed price quote first. Seriously, how unprofessional is it to just guess and quote blind over the phone or by email?! This is just lazy and stupid, as mistakes will be made like under pricing. And when they arrive to do the job, the quote will more than likely be wrong and they will increase the price when they start the work. 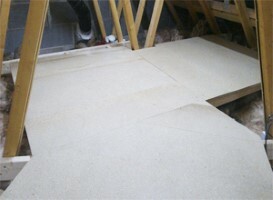 Doing a survey will check to see if firstly, you can have loft boarding done. Secondly, to check to see if the ceiling is strong enough and to work out the area to be boarded and thirdly is to see if the ladder and hatch will go in the place you want it to. The price we quote is the price you pay when you are happy with the completed work, and NO deposits are required. A survey and written quote is free of charge, so it's worth the time to get it done.